As e-books become a more viable publishing model, it's getting easier for indie books to reach a wide audience. And now a small project called StoryBundle is aimed at helping you discover a collection of new authors every month — without a big publishing house acting as middleman, taking a huge cut of the author's profits. Started a few months ago, StoryBundle's latest collection of novels is devoted to horror, since this is the spookiest time of year. Like the HumbleBundle project — which focuses on big-name authors — StoryBundle sales go partly to charity, and partly to the authors (you choose how much to give, and to whom). Started by Jason Chen, formerly an editor at io9's sister sites Gizmodo and Lifehacker, StoryBundle's main goal is to bring more exposure to authors who are selling their work without going through traditional publishing houses. Chen told io9, "I'm looking to basically only feature titles that aren't being published by publishers so that the entire author's share of the proceeds can go to the author. Our previous authors have all been very happy with the exposure and the earnings generated so far." He added, "3600 people ordered the first bundle, we raised about $30k total, and about $1.5k went to charity. Half the people decided to donate the 10% charity, which comes out about 5% of the total earnings." One author, Joseph Nassie, participated in the first bundle in August and was so pleased he came back in October to curate the horror bundle. We're very proud to have Joseph Nassise, a former two-term president of the Horror Writers Association, curate the Halloween Horror Bundle for us. Joe's carefully selected these books to represent a wide range of horror and dark fantasy for all types of readers to enjoy. 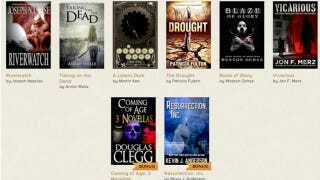 Collectively, our authors featured in this bundle include multiple Bram Stoker Award nominees and winners, multiple International Horror Guild Award nominees and winners, New York Times bestsellers, a Nebula Award nominee, and (of course) a former president of the Horror Writers Association, the world's largest organization of professional horror writers. The next bundle will be our holiday bundle, and I'm looking at collecting all sorts of different genres so there's something for everyone. The following ones after the Holiday bundle are going to include fantasy, romance, sci fi again, mystery, YA/middle grade and so on, depending on the submissions. Want to read some cool new fiction that you can't find in any bookstore? Then try the latest StoryBundle.